Nicaragua Vacation Hotels Resort Accommodations For Vacations, In Nicaragua when they are giving directions they don’t use east and west. Instead they use upstairs and downstairs, a reference to when the sun rises towards the heavens (upstairs, or east) and then when the sun descends (downstairs, or west). They will sometimes also have multiple names for a single street intersection (maybe one name for each corner), which can also further complicate things. An outdoor pool, conference centre and air-conditioned rooms with free Wi-Fi can be found at the Crowne Plaza Managua. Situated 12 km from Managua Airport, it offers a free local area shuttle. Crowne Plaza Managua is designed in the style of a typical Mayan pyramid. Its spacious rooms overlook Lake Managua or the mountains. All include LCD cable TV, a coffee maker and minibar. The Los Continentes restaurant offers international cuisine and a varied daily breakfast, including brunch on Sundays. You can also enjoy meals outside on the terrace. The hotel is just 2.5 km from the historic centre of Managua. Free parking is available on site, and staff can provide information about the local area. Accommodation Hotel Rooms: 140, Hotel Chain: Crowne Plaza Hotels & Resorts. Hotel Aloha is located in central Managua, just 400 metres from the city’s bus station. It offers a 24-hour reception and air-conditioned rooms with free Wi-Fi and flat-screen cable TV. A daily breakfast is served in the Aloha’s snack bar. There is a wide variety of restaurants within 5 minutes’ walk which offer a free delivery service. The hotel has a terrace where you can get a relaxing massage. Staff at reception can provide information about what to see and do in Managua. Tiscapa Lagoon is 1 km away, and the Metrocentro Shopping centre is just 400 metres away. Managua Airport is a 15-minute drive away. This stylish boutique hotel is located just outside Managua, 12 minutes’ drive from the city centre. It offers a spa, an outdoor pool and attractive rooms with free Wi-Fi. The air-conditioned rooms at Hotel Contempo feature minimalist décor and plenty of natural light. Each one comes with flat-screen satellite TV and a private bathroom with a hairdryer. The hotel’s Restaurante Azul offers French gourmet cuisine, using fresh, local produce. All guests also receive a welcome cocktail on arrival at the hotel. The Contempo offers massage services, and the spa also features a hot tub. There is also direct access to Nejapa Golf Club. Managua Airport is a 20-minute drive from Hotel Contempo. On request you can use the airport shuttle service, as well as the transport service to the city centre and other destinations. Hotel Colonial Granada is in the centre of Granada, on the shores of Lake Nicaragua. It offers 2 outdoor pools, a gym and massage service, free Wi-Fi and a 24-hour reception. The colonial-style rooms feature tiled floors and have air conditioning and a fan. There is cable TV, a desk and private bathroom with a shower and toiletries. The hotel has an à la carte restaurant, a bar and poolside bar. It is possible to have breakfast in your room. You can hire a car from the tour desk and there is reasonably priced on-site parking. An airport shuttle service is available for an extra charge. Nicaragua is a representative democratic republic located in Central America. The country is situated between the Pacific Ocean, which lies to its west, and the Caribbean Sea, which lies towards its east. Moreover, it is located very near to Equator, just 11 degrees towards its north. The name of the county is derived from two words ‘Nicarao’ and ‘Agua’. ‘Nicarao’ is the name of the Nahuatl-speaking tribe that inhabited the shores of Lago de Nicaragua before the Spanish conquest of the Americas. ‘Agua’ is a Spanish word meaning water, used due to the presence of the large lakes Lago de Nicaragua (Cocibolca) and Lago de Managua (Xolotlán), along with several lagoons and rivers. Entry requirements: Valid U.S. or British passport. $5 tourist card purchased on entry. Hotel taxes & service charges: 15% hotel tax. Currency: Cordoba. Exchange available at hotels, banks and tourist agencies. ATMs in Managua, and major credit cards accepted in main cities. Banking hour: 8:30 – 5:00 p.m. Monday thru Friday, and from 8:30 a.m. – 12:30 a.m. Saturday. Shopping: A full range of handicrafts are offered in Managua at leading markets including Mercado Roberto Huembes and Casa de las Artes del Pueblo. Best selling crafts include wood carved items, jewelry, palm fiber ware, soapstone figures, ceramic copies of pre-Columbian art, and Nicaraguan cigars. Note: Avoid many of Nicaragua’s truly exotic shopping bargains like iguana skin shoes, boa constrictor belts, and black coral jewelry; these items cannot be brought back into the United States. U.S. Customs will confiscate all such items and traveler is subject to a substantial fine. Food and Drink: Nicaragua is the best place in Central America for steak. Excellent steak houses feature prime beef with a host of Nicaraguan side dishes including vigoron (yucca with fried pork skins) usually served with coleslaw. Lobster is also popular as are several fish dishes, the most popular being guapote. Also try nacatamales (spicy, often hot tamales). The locals drink good Nicaraguan rum, plenty of fresh fruit juices plus several unique drinks including tiste (cacao and corn) and posol con leche a tasty corn milk concoction. Tipping: Gratuities are not included on a restaurant bill. Telephone Area Codes: (505) country code; Managua (2), Granada (55) and Leon (311). Nicaragua is tropical with regions of cooler mountains. The year is divided by seasons with the dry (December – May) and rainy (June – November). 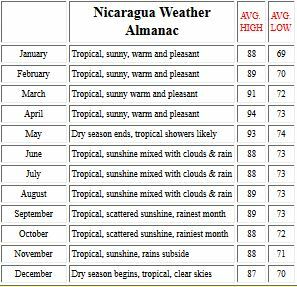 Managua is hottest in March and April when highs often go over 90°F degrees. Evenings, however, are always pleasant, and overall the country is enjoyable to visit year ’round. Take A Break Holidays takeabreakholiday, Nicaragua Accommodation.